This is a very simple dish but so delicious and moreish! The Padrón pepper, from the town of Padrón in the Galicia region of Spain, is usually picked early before reaching its full size and certainly before it turns red. 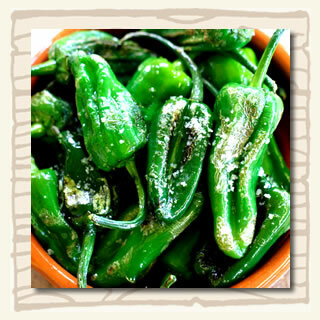 Padrón peppers fried in olive oil and sprinkled with sea salt is becoming one of the most popular tapas throughout Spain. Take a pan and pour enough oil to generously cover the bottom of the frying pan. Turn the heat up on the burner. When the olive oil starts to sizzle, throw the peppers in whole. Fry and turn until the peppers have small white blisters all over. Sprinkle with salt flakes and serve.